Be the first to share your favorite memory, photo or story of Beula. This memorial page is dedicated for family, friends and future generations to celebrate the life of their loved one. 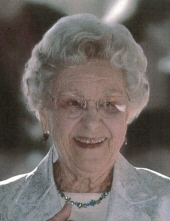 Beula Johnson Reese, age 98, passed away on March 18, 2019 at Sunrise Assisted Living in Decatur. Beula, known as “Bu” by her family, passed away peacefully in the presence of her family members. Beula was born the youngest of three children on a farm outside of Turin, GA on February 25, 1921. She married Robert “Bob” P. Reese in 1941 and worked in his accounting firm until his death in 1984. She continued to work for the successors of the firm until her retirement at age 91 in 2012. After marrying Bob, Beula traveled with him throughout the United States as he trained to become an Army aviator. She continued her love of travel well into her retirement, visiting Europe several times. Beula was a strong, unpretentious woman who was universally respected for her practicality and good humor. She was a member of Oak Grove United Methodist Church in DeKalb County until her move to Sunrise Assisted Living in 2016. Beula is preceded in death by her son, Alan, and her husband Bob. She is survived by her daughters Sheron Quinn of Atlanta and Holly Petrosky of Nashville, Tennessee as well as her grandchildren, Stephen Quinn of Decatur and Elizabeth Quinn of Asheville, North Carolina. She is also survived by three great-granddaughters. Memorial Services for Beula will be held at 11:00 Thursday morning at A.S. Turner and Sons in Decatur. Visitation will be 10 to 11 am the same day. A family burial will follow in Turin, GA. In lieu of flowers, donations may be made to the Alzheimer’s Association. To send flowers or a remembrance gift to the family of Beula Elizabeth Reese, please visit our Tribute Store. "Email Address" would like to share the life celebration of Beula Elizabeth Reese. Click on the "link" to go to share a favorite memory or leave a condolence message for the family.